The Alan Fraser " Monster Tiger " of Chris Gruys has been accepted for participation in the Monterey Historic. Dan Walters will be driving it in group 7B (Sunday) with the Shelbys. What can be said about Dan Walters that everybody doesn't already know, or wouldn't believe from any source. An expert professional mechanic and racing driver of Tigers and Alpines. The home to the largest collection of parts for either car, the past president of CAT, the designer of a modern rear axle removal tool and limited slip differential torque measurer, as well as a torque-tube rear axle ;locator design, and the finest racing mechanic for these cars. Did I say hard to believe? Well, let's test those tales. In this Monterey Historic he is the assigned driver of the "Monster" Tiger. Yeah, big deal! Well, he is also the race mechanic. Not so much? He is also the race mechanic of his own entry, the "Black" Tiger, being driven by yet another Tiger/Sunbeam star, Steve Alcala. Had enough? He has been, and still is the race mechanic of Tom Sakai's "Yellow Tiger", as well as Darrell Mountjoy's Le Mans Tiger ADU-180B. I guess that covers all entrants but the Targa Florio Tiger of Denver based Dave McDermott. And that isn't a season, just one race. Oh yes, he wins a lot, too, as do his customers cars. 'Nuff said. Where does this newlywed get his time and energy? Beats me! In 1965 Bernard Unett, a Rootes factory driver, was given the Lister Tiger Le Mans coupe, ADU 180B (which had run at Le Mans in 1964, by the factory) to race. He set out by modifying the suspension set up, and changing to Weber carbs, etc. 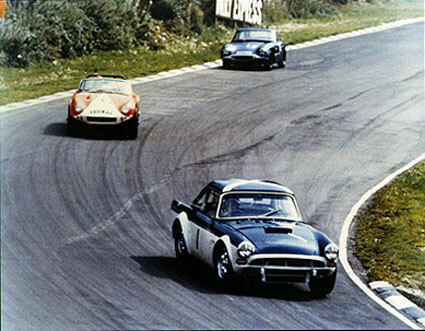 Unett almost won the European championship losing by a whisker in the last race for 1965. Alan Fraser, who had run a group 3 Tiger that year, approached Unett to build a "Monster" Tiger to contest the European championship in l966. Unett agreed to be the driver, and they took the drive line components, doors, etc. from the Le Mans car and built up the car you see today. Once again, this car proved highly competitive, winning a number of races outright, but like its predecessor, losing the final race, and finishing second in the championship. Fraser, having some tax problems in England, sent the group 3 car and the Monster Tiger to Tenerife (In the Canary islands). It was raced there, and then ended up in the hands of some of the locals. In the late 70's, Ken Dalziel located the Le Mans coupe in a barn, missing its doors, hood, suspension, and drive line items. He set about putting it together, and running it in some vintage events. He then offered it for sale, and I purchased it. He told me that he had located the Fraser cars in Tenerife, and was selling the Le Mans coupe to buy them. This was in l979. About two years later he called me to say he had the Fraser cars, but decided not to restore them, and was interested in selling them. I asked if the Monster Tiger still had the Le Mans coupe suspension on it. He said yes so I bought them. When I received the cars they were "rust buckets" and I transferred the Le Mans suspension back to it, and then later sold the coupe after racing it. 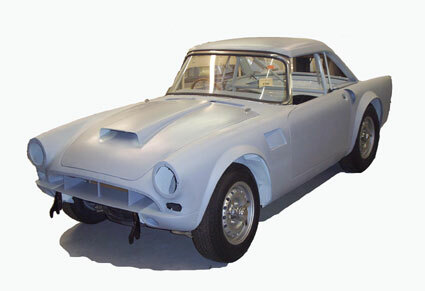 The Fraser cars remained in that condition until three years ago when I set about restoring the Monster Tiger. Little did I know! The corrosion was extensive and it took two and a half years to correct this. It turned out that the doors on the Monster Tiger were the ones from the Le Mans coupe, and so it remains today. A little of the parent is still with the child. The special features of the Monster Tiger are aluminum hood, doors, hardtop and trunk. It has l5" wheels, larger brakes, a 4 parallel link rear suspension and Weber induction (not yet installed). After three years, a lot of money, and effort, the car has come back to life to race again. I would like to thank the following people who were instrumental in making this car what it is today. Colin Kimmins for the restoration of the body work, Steve Alcala for finishing the body work and fabrication of components, Rick Fitzgerald for the paint, and Dan Walters for the mechanical work, as well as the driving chores. For Team Gruys, Lorraine & Chris, this represents the culmination of bringing the Monster back from ashes, much like the mythical Phoenix bird, to once again take its place as one of the premiere British racing cars from a bygone era. The Monster Tiger made it's Debut at the VARA race at Fontana. We missed the noon time drive around but we did get the hard top on and drove around the infield. We still have a " to do " list but it is manageable. The first track event is next weekend at the "Pre-Historics". Inspection, Pre-Historics, Historics, and other non-Tiger vehicles whose steering wheels were thrust into my hand by trusting strangers, a cockpit view. We used the Pre-Historic event ( the weekend before the Historics ) as a test weekend for the Monster Tiger. The Monster Tiger had about 20 minutes of around the block testing before the Pre-Historics. The first practice session came off ok with the brakes working excellent, the handling was good with some oversteer and power was down a bit. The vital signs were good but we had a mystery oil leak. We were grided near the back for the Saturday race and started with the motor unexpectedly not running on all cylinders. After a few laps, I brought the car in and rebuilt the carb and checked the plugs. I found the oil leak coming from a split in the new valve cover. The Sunday warm up had us running on all cylinders and everything seemed in good shape. We were grided near the back for the Sunday race and ended up staying there. Because of a lack of power and unable to hook up the little power I did have, with the oversteer and hard Dunlap tires, I ran with traffic ahead of us the whole race. We ran a best lap time of 1:56. To add to the "Experience" the HMSA tech crew were having a hard time with why the Monster Tiger had 15" wheels and big flares. They also wanted to pump the motor for a displacement check. We agreed upon Thursday morning as the time to be pumped. I contact Chris and have him bring pictures for the Tech crew. I forgot the camera so use your imagination, it was nicely charged at home. I brought the Monster Tiger to tech on the trailer Thursday morning ready to be pumped ( with rocker arms off from one cylinder ) and was told they didn't have the time to pump it until Friday. However, I did need to unload the car and drive it back to tech for the standard checks. Chris Gruys shows up in tech and has the original Pictures of the Monster Tiger and gives them to me to show the tech guys. I did ask to get the motor pumped Thursday night and was ready (rockers off for the second time ), no one showed. I go to get the pictures of the Monster Tiger to show someone and they have DISAPPEARED! I rip the place apart looking for the pictures! I can't reach Chris! Friday morning I go to tech and ask them about the pictures, Not seen! and about the pump, nobody knows. A tech guy came by and said I was not going to be pumped and have a good weekend. I put the rockers back on. Chris shows up and I ask him if he has the pictures, He does! Things are looking up! I put on the Hoosier tires and was concerned about them rubbing on the inside on the rear. We went out in the Friday practice session and followed Tom Sakai around for a few laps. The oversteer was the main problem and I could not keep up with Tom on the straights. Lap times were 1:54. I checked the rear tires and they where rubbing the springs. I moved the spring clamps and spaced the wheels out as much as I could. At the end of the day the tech guys came by and said they wanted to pump Tom's engine and while they were at it they may as well pump the Monster Tiger also. We agreed upon 9am Saturday morning. Rockers off AGAIN! The tech crew showed up just before 9am and pumped both cars and checked wheel widths, front brakes and shocks. They left happy with their info. Peter was having trouble with the brakes and Dave had more oversteer than he wanted. I followed Tom again in the Sunday morning warm up. He could pull me down the straights but I could real him in under braking. The rear tires where still rubbing the springs but not critically. The Sunday afternoon race had Tom racing with a Cobra that could not pass Tom on the straights and I had a Corvette in front of me and a Corvette behind. The Cobra got by Tom and I got by the Corvette and then the Corvette from behind got by me. On the 8th lap I over cooked turn 2 and spun into the second apex. I lost 2 positions and finished 22nd. I ended up in front of the lead car who took the checker just behind me. I didn't know the checker was out until I waved the lead car by and saw him waving at everyone. I came in after the lead car and did not take my last lap. My best lap time was 1:50.7. Tom was 19th. toward the end of September( I think I heard the 21st ). On the Trans-Am front, as if I had some spare time, I ran the Camaro on Friday morning. I followed Camee Edelbrock for several laps, she could pull me down the straights but I could real her in under braking. I turned a best lap of 1:45.9. I was grided 13th behind the Edelbrocks and Tom McIntyre The grids are a bit of a mystery. I managed to pass the Edelbrocks and McIntyre but was passed by a couple of cars and finished 10th at the end of the lead pack. I just made it on the board. My best lap time was 1:48. We are talking about taking the Monster Tiger to Europe next year!